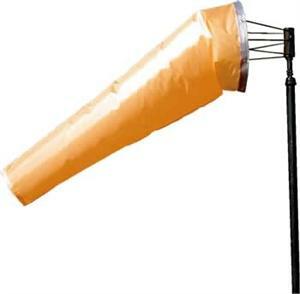 Airport Windsock (18" x 96") 8 feet is available in visible bright orange. Airport Windsock (18" x 96") 8 feet is available in white. Airport Windsock (18" x 96") 8 feet is available in visible bright yellow. This Windsock Frame is for windsocks 8 ft or 18" x 96". Must use with Windsock Part #1896-ELLSO (orange), 1896-ELLSY (yellow), or 1896-ELLSW (white). Windsock Pole for Windsock Frames. Windsock Pole Stationary Frangible Base for Windsock Frame 1 1/2" standard threaded poles.